Jennie is a Professor in Sustainable Nutrition and Health. Her research is interdisciplinary and about the impact of dietary habits on climate change and land use, with implications for food and nutrition security. This includes understanding eating behaviours in particular how to move people to eating healthy and sustainable diets, especially in the UK. She led the Livewell project funded by the WWF, the first to model sustainable diets that were both nutritionally adequate and had lower impact on climate change. 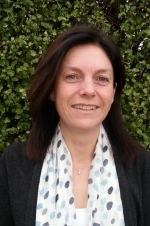 She leads a multi-disciplinary research team in Aberdeen and is the nutrition lead on several large interdisciplinary international research projects, including DEVIL (delivering food security on limited land https://deliveringfoodsecurity.org/) and AFRICAP (Agriculture and food-system resilience: increasing capacity and advising policy https://africap.info/). The research is based in the UK and internationally. In 2015 Jennie won the Principal’s Prize for Public Engagement with Research in Biomedical Sciences Awarded by the University of Aberdeen and Wellcome Trust. Jennie graduated from the University of Surrey with a BSc (Hons) in Nutrition and Food Science, during which she spent a year working at one of the CSIRO research laboratories in Melbourne, Australia. After graduating she worked as a research assistant at the Institute of Food Research (Norwich) and the University of Dundee (Psychology dept) researching eating behaviours. In 1997 she completed her PhD at the University of Leeds (Psychology dept) on the characteristics of high and low fat consumers. She spent 18 months working for the International Obesity Task Force, based at the Rowett Research Institute in Aberdeen. In 1999 she moved to the University of Aberdeen Medical School to run a project studying the long-term health effects of professional diving. In 2006 she joined the Public Health Nutrition Research groups at the Rowett Institute at the University of Aberdeen, where she now works. Food and nutrition security (climate change, land use, trade). Dietary behaviours, habits and food choices. 1. Dietary behaviours and habits in the context of shifting to sustainable diets with complex social systems (agent-based modelling). 2. DEVIL - Delivering Food Security on Limited Land (Belmont Forum/FACCE-JPI project). 3. AFRICAP - Agriculture and Food-Systems resilience: increasing capacity and advising policy (GCRF funded). 4. Sustainable and Healthy diets in India (SAHDI) Wellcome Trust. International collaboration, including USA, Australia, Brazil, India, Switzerland, South Africa, Malawi, Zambia, Tanzania. Scottish Government (Rural and Environment Research Analysis Directorate) (2017-21) Programme of research on sustainable diets. Wellcome Trust (2017-2019) Sustainable and Healthy Food Systems (SHEFS). London School of Hygiene and Tropical Medicine, University of Aberdeen. Belmont Forum/FACCE-JPI International Collaborative Research Funding (2015-2019). DEVIL (Delivering Food Security on Limited Land), International multidisciplinary partnership (8 countries). Led by University of Aberdeen. Wellcome Trust (2014-16) Sustainable and healthy diets in India. London School of Hygiene and Tropical Medicine, University of Aberdeen. Food Standards Agency Scotland (2012-13) Estimate of the greenhouse gas emissions of the Eatwell week. Aberdeen University. WWF-UK (2010) Livewell project: A balance of healthy and sustainable food choices. University of Aberdeen. Food Standards Agency Scotland (2007-2008) Secondary Analysis of the Survey of Sugar Intake among Children in Scotland. University of Aberdeen. Scottish Government (Rural and Environment Research Analysis Directorate) (2009-12) Environmental Determinants of Public Health in Scotland (EDPHiS) Obesity case study. Unversity of Aberdeen, University of Glasgow. Health and Safety Executive (2003) Identification of factors affecting quality of life in divers and offshore workers. University of Aberdeen. Health and Safety Executive (2002) Attitudes to safety culture among divers and offshore work. University of Aberdeen. Lucy Sam (2016-present) Investigation of domestic food practices and routines, and their determinants. Charlotte Hall (2014-present) Environmental consequences of delivering food security. Renaud Heckle (2014-2018) Constraints and opportunities to integrate beekeeping into mixed farming in Sub-Saharan countries. Henri de Ruiter (2013- 2017) Implications of meeting a healthy diet for sustainable land use. Liam McMorrow (2012-2018) An economic analysis of food choice and its associations with health inequalities. Tania Griffin (2007-2011) SNAK: educational intervention to improve the knowledge of non-milk extrinsic sugars and energy balance among children aged 11-12 years.